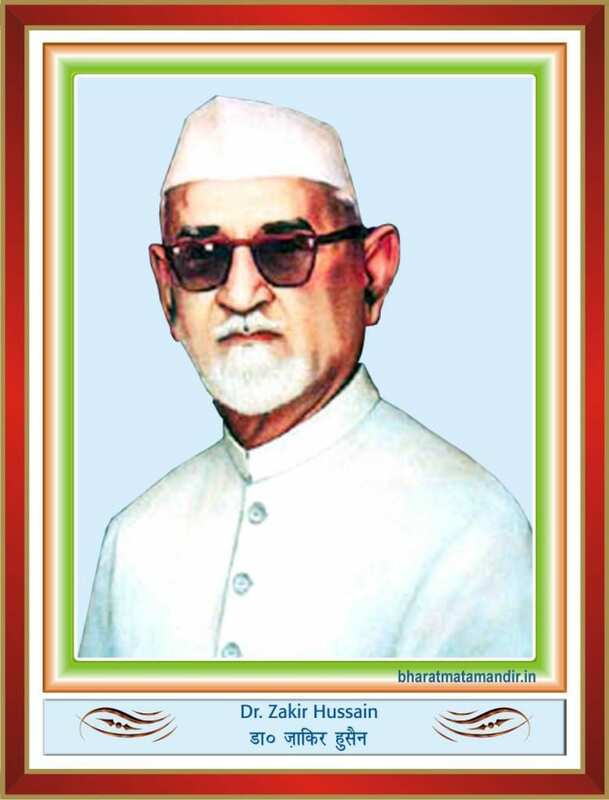 Dr. Zakir Hussain (8 February 1897 – 3 May 1969) (Urdu: زاکِر حسین), was the third President of India from 13 May 1967 until his death on 3 May 1969. He was the first elected Muslim president of India. Hussain was born in Etawah, India. Zakhir Hussain was a an ethnic Pashtun. His family had migrated to Hyderabad from Kaimganj, district Farrukhabad in Uttar Pradesh. He was educated at Islamia High School, Etawah and at the Anglo-Muhammadan Oriental College (now Aligarh Muslim University, where he was a prominent student leader). He was known, even in those days for his love of knowledge, his wit and eloquence and his readiness to help his fellow students. His father, Fida Hussain Khan, went to Hyderabad, studied Law and had a most successful career. Unfortunately, he died when Zakir Hussain was only ten years old. Hussain, then only 23, was among the small group of students and teachers who founded a National Muslim University, first founded in Aligardh on Friday 29 October 1920 then shifted to Karol Bagh, New Delhi in 1925, then after shifted again on 1 March 1935 in Jamia Nagar, New Delhi and named it Jamia Millia Islamia (a central university). He subsequently went to Germany to obtain a PhD from the University of Berlin in Economics. While in Germany, Hussain was instrumental in bringing out the anthology of arguably the greatest Urdu poet Mirza Assadullah Khan “Ghalib” (1797–1868). He returned to India to head the Jamia Millia Islamia which was facing closure in 1927. He continued in that position for the next twenty-one years providing academic and managerial leadership to an institution that was intimately involved with India’s struggle for freedom from the British Rule and experimented with value base education on the lines advocated by Mahatma Gandhi. During this period he continued to engage himself with movements for educational reforms in India and was particularly active in the affairs of his old alma mater the MAO College, now the Aligarh Muslim University. During this period Hussain emerged as one of the most prominent educational thinkers and practitioners of modern India. His personal sacrifice and untiring efforts to keep the Jamia afloat in very adverse circumstances won him appreciation of even his arch political rivals like Mohammed Ali Jinnah. Soon after India attained independence, Hussain agreed to be the Vice chancellor of the Aligarh Muslim University which was facing trying times in post partition India because of active involvement of a section of its teachers and students in the movement for creation of Pakistan, where incidentally Hussain’s relatives brother Dr. Mahmood Hussain and nephew General Rahimuddin Khan would migrate to and achieve eminence. Dr Hussain, again, provided leadership during a critical phase of the history of the University at Aligarh from 1948-1956. Soon after completing his term as Vice Chancellor he was nominated as a member of the Upper House of Indian Parliament in 1956, a position he vacated in 1957 to become Governor of the State of Bihar. After serving as the Governor of Bihar from 1957 to 1962, and as the second Vice President of India from 1962 to 1967, Hussain was elected President of India on 13 May 1967. In his inaugural speech he said that the whole of India was his home and all its people were his family. Hussain died on 3 May 1969, the first Indian President to die in office. He is buried on the campus of the Jamia Millia Islamia (or Central University) in New Delhi.